(a) Lateral view of a typical thoracic vertebra. 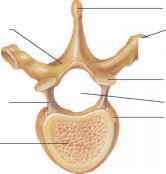 (b) Adjacent vertebrae join at their articulating processes. (c) Superior view of a typical thoracic vertebra. Superior view of the (a) atlas and (b) axis. 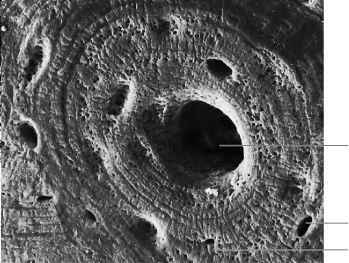 (c) Lateral view of the axis. 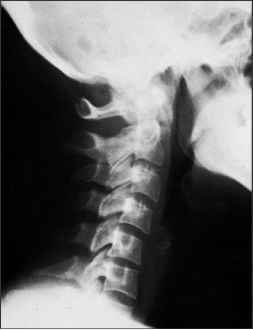 Radiograph of the cervical vertebrae. The sacrum (sa'krum) is a triangular structure at the base of the vertebral column. It is composed of five vertebrae that develop separately but gradually fuse between ages eighteen and thirty. The spinous processes of these fused bones form a ridge of tubercles, the median sacral crest. Nerves and blood vessels pass through rows of openings, called the dorsal sacral foramina, located to the sides of the tubercles (fig. 7.39). The sacrum is wedged between the coxae of the pelvis and is united to them at its auricular surfaces by fibrocarti-lage of the sacroiliac joints. The pelvic girdle transmits the body's weight to the legs at these joints (see fig. 7.17). The sacrum forms the posterior wall of the pelvic cavity. The upper anterior margin of the sacrum, which represents the body of the first sacral vertebra, is called the sacral promontory (sa'kral prom'on-to"re). During a vaginal examination, a physician can feel this projection and use it as a guide in determining the size of the pelvis. This measurement is helpful in estimating how easily an infant may be able to pass through a woman's pelvic cavity during childbirth. The vertebral foramina of the sacral vertebrae form the sacral canal, which continues through the sacrum to an opening of variable size at the tip, called the sacral hiatus (hi-a'tus). This foramen exists because the laminae of the last sacral vertebra are not fused. On the ventral surface of the sacrum, four pairs of pelvic sacral foramina provide passageways for nerves and blood vessels.